One modder just couldn’t wait for Microsoft’s Courier, so he took his Dell mini 9 and added on a USB touchscreen display. And surprisingly enough, it works. 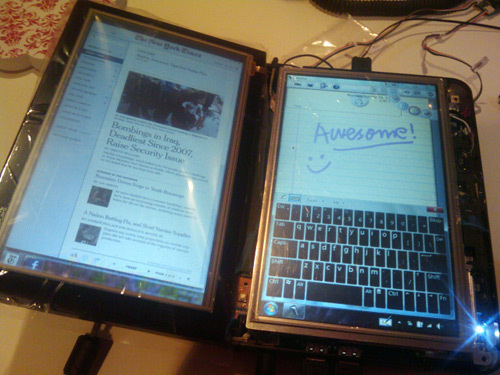 Nicknamed Harlequin, the device allows you to type and write on the right (the touchscreen) and read on the left (the original mini 9 display). Thanks to Windows 7’s native handwriting and speech recognition, those issues have been solved at the base software level.